It’s relieving to know that we live in a golden age of the indie game. Never before has there been such a wide variety of experiences available, with inspiration coming from both the past and the present. That said, I’ve personally always found joy in harkening back to the days of old. There’s a treasure trove of potential to be found in taking ideas from eras limited by their technology and realizing them to their fullest. Perhaps the greatest thing to take away from older games is their simplicity. The further back you go, the less complicated they get. A game for a late 1970s system is going to have only a handful of rules, for example. Not that newer games can’t have a simple touch, but it’s easy to become overwhelmed at the sight of the most recent multiplayer bonanza. Sometimes, the least detailed ideas can yield big results. JUMPGRID is one of these games. It’s not Ian MacLarty’s first game: he’s been developing small surrealist projects since 2010. Having played through a third of his catalogue for the purposes of this review, however, I’m confident in asserting that JUMPGRID is his best so far. In fact, it’s the best puzzle game I’ve played since Portal. And I really love me some Valve! We don’t talk about Artifact, though, but does anybody? JUMPGRID is as simple as simple gets on its surface. You control a little white dot on a grid, and each intersecting point on the grid has an object on it. You complete a level by collecting them all and entering the resulting portal to the next level. You see, JUMPGRID is just as non-threateningly uncomplicated as indie games get. The threat is in how ****ing difficult the ****ing thing is. I love this game. I love this game a lot. But f*** this game. JUMPGRID’s challenge is like being dared to eat a whole ghost pepper; simple and clean in theory, but the Devil is in the details. You see, JUMPGRID loves to throw whatever it bloody well wants at you. Irregularly-fired projectiles, constantly marching lines of death, frickin’ laser beams, lines of death with frickin’ laser beams attached to their heads…it’s brutal. But JUMPGRID’s true genius, its raison d’être, is its ability to keep you hooked on your own failures. No matter how many times your little white dot kicks the bucket, it’s not long before you’re back in the action. In this regard, it borrows one of Super Meat Boy’s most dastardly tricks; that short but damning gap between death and rebirth that lets you remind yourself of your own failure, but doesn’t give you enough time to think of anybody to blame but yourself. It’s just about one second in JUMPGRID, but it’ll add up to minutes and – if you’re masochistic enough – hours. There’s not actually much to do in JUMPGRID with 100 levels spread out across four ‘quadrants’. Yet, the difficulty manages to make these levels last. You’ll get a fluke sometimes and walk away with an easy win, for sure, but there’s always an absolute b**** of a level just around the corner. One level in particular took me an hour to beat. Yes, an hour. It became so mind-tormentingly outside of my expertise that I began to question the nature of the game. Was this a brainwashing tool? Had I unwillingly stumbled upon Polybius, in all its hypnotic glory? Was I becoming an obsessed fool like the desperate prospectors in the pulp westerns of old? Or was I just bad at video games? Any game can be difficult, but not every hard game can keep you hooked. JUMPGRID has its well-balanced failure reminders, but the game’s also such a joy to look at. Visuals inspired by the Atari 2600 era of when ‘colour theory’ was a euphemism for ‘abusing the hell out of one colour’ and sound design inspired by the tinny speakers of the vertex graphics arcade games of the late 70s and early 80s add to the extremely mind-warping experience. Death in particular is accompanied by a harsh scream and flashing lights, piling onto the effect of the short-but-sweet respawn time. But when you succeed? You feel like a champion. 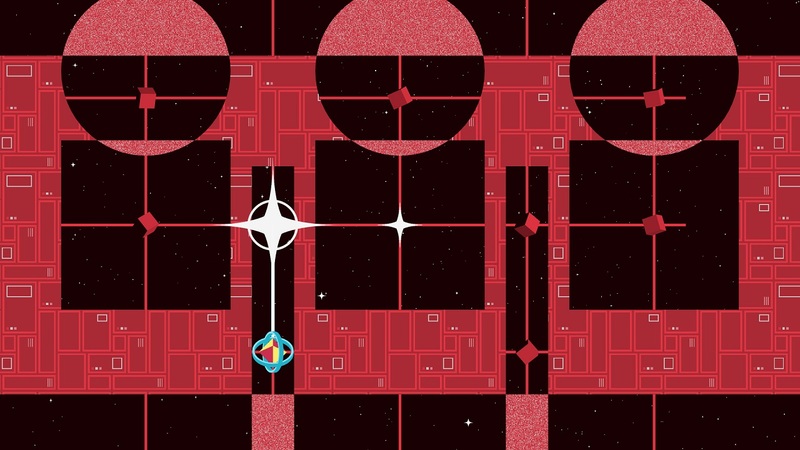 JUMPGRID, as with many games like it, doesn’t let you revel in victory. It lets you drink it in yourself, however you like. Sometimes, it’ll be a slow exhale and a lean back into your chair. Others, it’s a loud cry of triumph as you scream profanities at the screen. But you’ll only manage two F-bombs at best, because it’s right back into the action. And another death. You fool. Yes, perhaps it can get a little too frustrating. There’s nothing more upsetting than to get stuck into a pattern of attack for minutes on end, only to find that it was flawed from the start and you’ll have to try a whole new plan. On top of that, many levels require a trial-and-error approach that don’t let you experiment as much as you’d like. Combine that with a pulsating electronic soundtrack, and you get the closest thing to self-induced insanity without being the subject of a Men At Work song. Yes, JUMPGRID is a very special game indeed. The difficulty featured here will probably be child’s play for dodge-em-up experts, but most players will be feeling its ‘Dante Must Die’ aura pretty heavily. Combine that with a charming aesthetic and you get an indie title that should never be missed.